Well the Black Panther movie is out and by accounts its a winner. I've not seen it yet, hopefully I'll rectify that very soon. In the meantime, enjoy this, the second entry in a series I'll be calling From Script To Page. Today's entry is the splash page to Black Panther #30 (Marvel Comics, May 2001), written by Christopher Priest and drawn by my chum Norm Breyfogle. What you see here is the first page of the script, the preliminary sketch, the penciled page and the final, fully inked, page as published in the comic book. 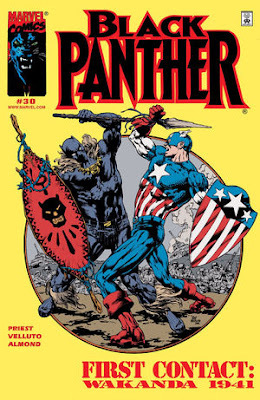 Titled The Story Thus Far, the comic book focuses on the somewhat convoluted relationship between The Black Panther and Captain America from their first meeting in World War II to the (then) present day. As with anything that Priest writes, there's a lot going on in these pages. A little treat for you art fans out there. It's been a long while since I've posted anything related to art and artists of any serious import, and there are reasons for this, but this isn't the time, nor the place, to get into any of that. 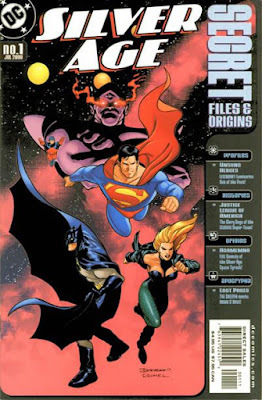 Needless to say that, thanks to Facebook and a group I'm now part of, my love and appreciation for original comic book art is beginning to return, and with a vengeance. I'm back collecting, as it should be. And I'm finally scanning my entire collection. This is no small task as it's now thousands of pages, original art, sketches, preliminaries, notes, letters, faxes, scripts, roughs - you name it, it's all there. It's a massive undertaking, sorting, scanning, recording, notating and finally storing all the art I own, but, honestly, it needs to be done.